If you can't learn to run with the pack, one of these days you'll be someone's dinner. The end title sequence of Jon Favreau’s The Jungle Book is a gorgeous postscript and one that can only be properly understood through its lineage. 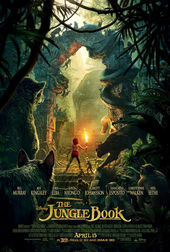 Disney’s 1967 adaptation is an animated film, beautifully painted and designed, featuring animals that dance, talk, and sing, while the 1994 version is live-action, and the animals do not speak. The 2016 The Jungle Book brings these two together in a combined live-action/CGI aesthetic that lifts the fantastic fable to a new level. As with his previous family-friendly film Elf, Favreau pays loving homage to the source material. 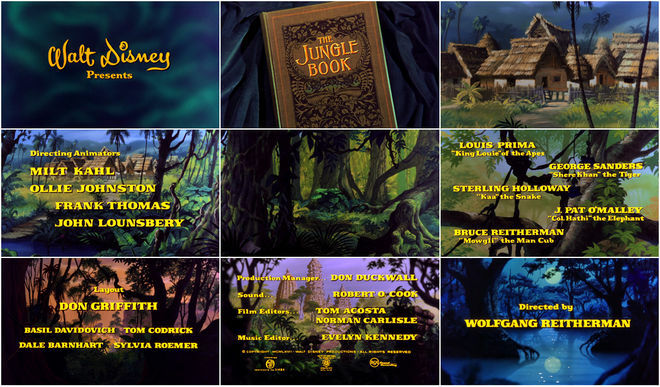 The opening of the 1967 The Jungle Book features a worn hardcover book laying atop a blue velvet background that opens to reveal black-and-white illustrations and the names of the film’s key players. 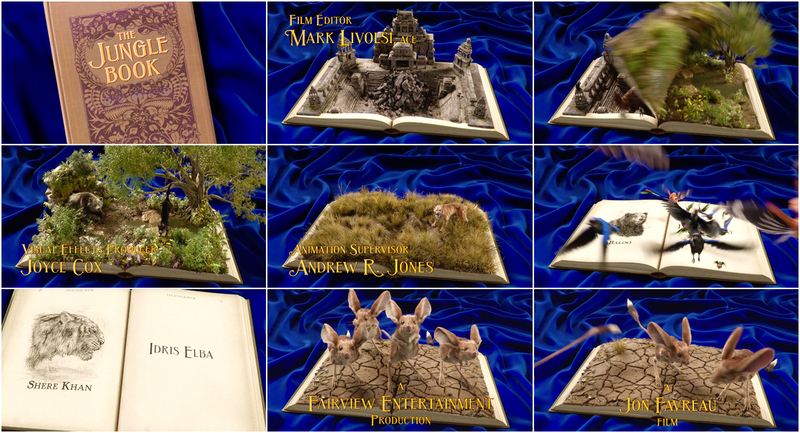 Notably, the film has no closing sequence featuring the book, a simple “The End” card doing the job. Here, Favreau takes that book and recreates it exactly, using it to open the film but also adding an end sequence to bring the story to a close with stunning vitality and depth. The book jumps off the velvet, coming to life and exploding with scenes from the film, spitting out singing orangutans, ferocious tigers, and sweet-faced pigs. It features black-and-white illustrations as well as credits typography in gold to match the original book. When the credits crawl appears, the book remains open, a couple of leisurely turtles making their way across the pages – a tongue-in-cheek poke at the ubiquitous closing roll of credits. Finally, the book is snapped shut and Christopher Walken’s rollicking voice fades out, replaced by the sultry sounds of Scarlett Johansson’s “Trust In Me” as the elements of the book’s cover are cut apart and the sequence takes on a graphic style. The imagery recalls moments from the film and the names of thousands of crew members roll past, drawing the curtain on an age-old tale.